We'll put a large ad on 4 pages of our website. 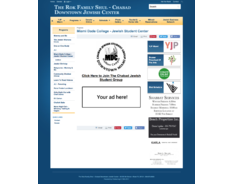 This is the official website of Rok Family Shul. We are the largest downtown/Brickell Shul in Miami and we frequently host events. We have a lot of web traffic from people looking to attend our events or get involved with the Miami Jewish community. Since its inception in January of 2005, The Shul of Downtown which is an affiliate of the worldwide Chabad organization and The Shul of Bal Harbour, has been providing critical educational programs and social, legal and student services. As it has expanded, it has become more and more vital that the programming have a home of its own. 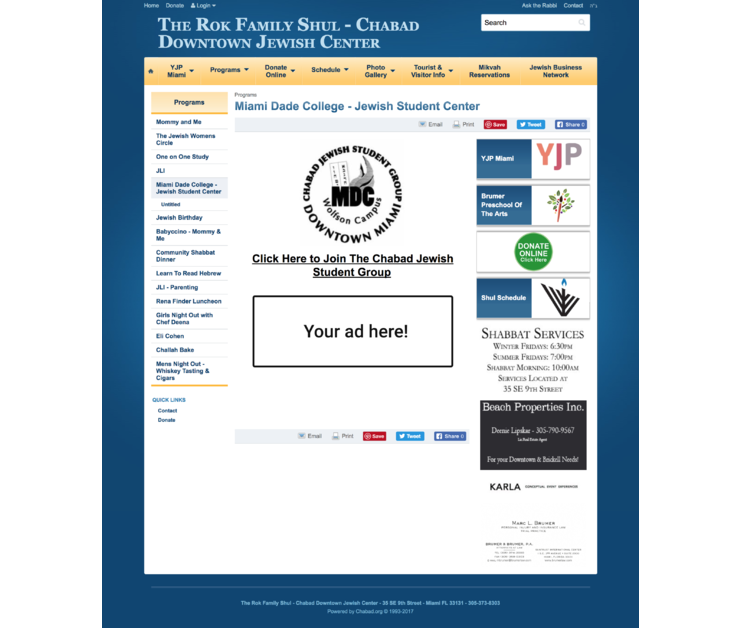 The enthusiastic response to The Shul of Downtown’s programs and presence in the community has made it apparent that what the Downtown area craves is a comprehensive educational center that will enrich the lives of the community, from the youngest child to the most senior person- an accepting, encouraging and inspiring center for Jewish life. Therefore, The Shul of Downtown has undertaken the mission of developing a full-service center for Jewish activities. The Center will provide programming for toddlers, children, university students, young professionals and adults. It will cater to all aspects of Jewish life and will be available for the respective needs of its community, with amenities such as a student lounge, library, social hall, preschool, rooftop garden and deck, lecture hall and sanctuary. Of course, creating an institution such as the one described, requires more than a beautiful, well-equipped building. Since its inception, The Shul of Downtown has strived to provide a connectedness and sense of Jewish pride to the community. The Center will remain committed to fulfilling that call as well as providing the best quality programming according to the highest professional standards all right in the heart of Downtown Miami.